Elements Applied: Flowers and the rhizome are commonly applied elements of the plant. Used For: The plant is known for its capacity to boost urination and perspiration, produce an expectorative and healing effect, stimulate the organism, and reduce pains. It is successfully applied for treating sores, bruises, wounds and skin irritation. Warning! Tincture is diluted before topical application, as it may cause burning and lead to blisters. 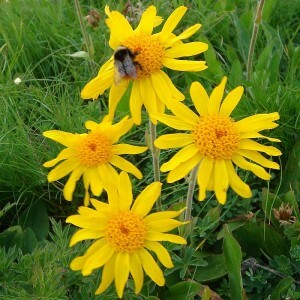 Arnica is also applied to fight stomachaches; in this case it’s used topically, in form of a poultice. Additional Info: The herb has a long lifespan and can reach up to 2 feet in height. The plant commonly grows in the mountains. The leaves are ovate-shaped and oblong. The leaves which grow at the top are smaller. The plant blossoms in summer period. Preparation and Intake: It’s recommended to apply only specially produced remedies. Don’t use the herb unless you have a consultation with your health-care provider. Safety: It’s highly suggested that you avoid applying the herb both topically and orally. Oral usage may lead to severe stomach spasms and fatality. Topical application may result in skin damage.